Approximately 100 of an estimated 11,000 migrants, less than 1 percent those U.S. officials are tracking across four groups, may reach the U.S. border south of San Diego on Sunday. The overwhelming majority of those from Central America fleeing hardship on foot are hundreds of miles away, weeks from nearing U.S. soil. A U.S. official speaking on the condition of anonymity confirmed to ABC News that border authorities are girding for the first group of about 100 to arrive in Tijuana by the end of the weekend. 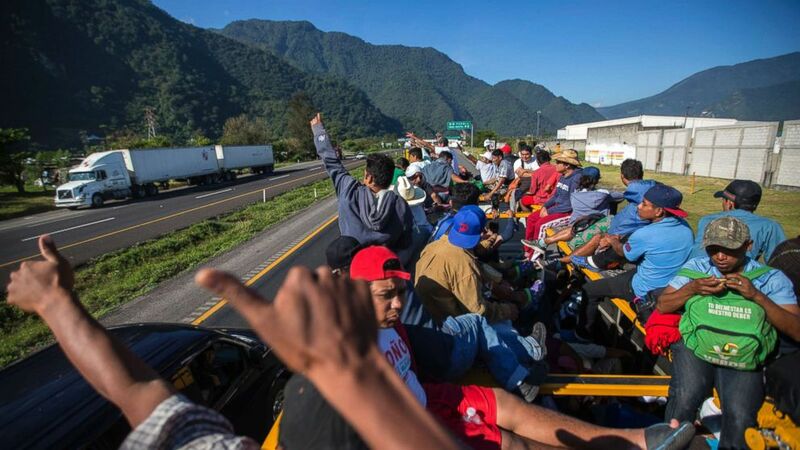 Central American migrants give a thumbs up to motorists who wave to them, as they begin their morning trek to reach the U.S. border as they leave Cordoba, Mexico, Nov. 5, 2018. The San Ysidro port of entry there is “at capacity,” and border officials anticipate asylum seekers will be stranded in Mexico until they can be processed, according to a statement emailed to ABC News by U.S. Customs and Border Protection. The so-called ports of entry aren’t designed to house hundreds of individuals at a given time while still enabling trade and travel between the two nations. President Donald Trump has threatened to use force against the migrants at the border should it come to that. ABC News’ Quinn Owen and Kirit Radia contributed to this report.